How a family owned multi-label retailer brought its products online without compromising on vision. The solution? 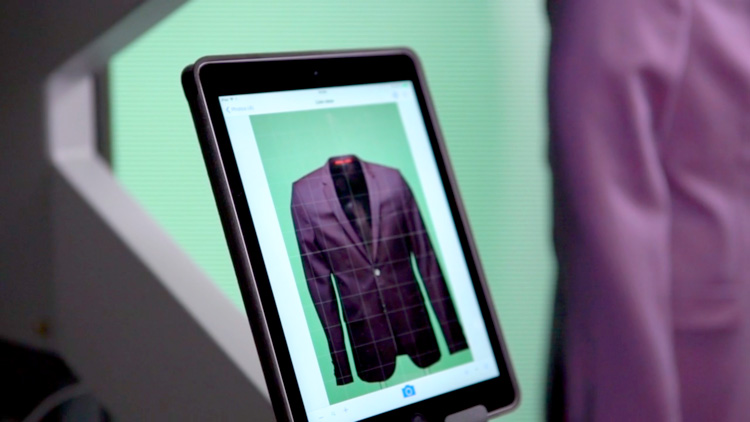 Creating a 'digital window store' to experience the world of Reischmann with the help of StyleShoots machines. Owned by generations of the same family for 150 years, Reischmann is a German multi-label fashion retailer who specialize in creating a luxury shopping experience “where the customer feels at home”. Originally starting with sportswear, Reischmann have 4 stores in Germany. Each one is carefully designed to instill a 'living room' atmosphere, where the store’s personal shoppers are on hand afford customers a level of comfort that they would find trying clothes on in front of their own wardrobe. In the words of Thomas Reischmann: "We don't just want to sell clothes. We want to sell a feeling. The experience of shopping - for us - has to happen in the store itself". Reischmann did, however, understand the importance that having an ecommerce presence is to all modern retailers. Therefore a digital approach that matched with their vision of a luxury, atmospheric shopping experience was needed. They decided that a system where the customer could browse their collections and reserve them in-store was true to retaining the same close level of customer connection passed on throughout generations of the Reischmann family. StyleShoots machines became crucial, then, in making it easier than ever for Reischmann to create photo content - from stunning "invisible man" product shots of their garments to inspiring flat lay collages - that would drive these shoppers in-store. Now in their fifth generation of family ownership, Reischmann focus on developing relationships with their shoppers - encouraging loyalty and a much more personal way to shop for clothes. It's something they believe can only be done in-store. When it comes to starting this relationship, presentation is paramount - and that's where StyleShoots machines come into the picture. "We don't just want to sell clothes. We want to sell a feeling. The experience of shopping - for us - has to happen in the store itself"
Reischmann's aim was creating a website that not only presents their products in a beautiful way, but one that inspires customers to visit their closest store and experience a true shopping experience. In order to achieve this, they decided to create a luxury 'digital 'window shop' that would show a customer all of the latest pieces in stock in a beautiful and efficient layout. Covering 3 key areas of apparel: sports and outerwear, on-trend streetwear and casualwear as well as higher end designer goods, each 'digital window shop' is branded differently: Reischmann Mode, Reischmann Trend and Reischmann Sport. "With our new website we want to offer the customer the possibility to get to know the world of Reischmann and get an experience of what it would be like to shop here"
Reischmann needed to keep the core of what made their brand loved in the first place when developing their new website. As a small family owned and operated business, they didn't want their customers to feel detached from the shopping experience they have worked so hard to cultivate over their storied, 150 year history. In the words of Bernd Deuter, Head of Marketing at Reischmann: "With our new website, we want to offer the customer the possibility to get to know the world of Reischmann and get an experience of what it would be like to shop here." This meant that creating a website where the customer feels at home browsing Reischmann's designer pieces. A website where the product imagery feels luxurious and almost tangible. When a customer visits one of Reischmann's new sites, instead of a lengthy checkout process, they simply click and reserve the items they wish to try on in person. They are then immediately scheduled for an appointment with one of Reischmann's in-store personal consultants. StyleShoots forms a fundamental part of getting these consistently high quality images of their garments online. When Reischmann hand pick new products for their seasonal collections, the clothes are immediately handed over the marketing team for shooting. In almost no time at all, and without the need for a professional photographer, the images are shot using a combination of both StyleShoots Vertical and Horizontal machines - then uploaded to their website. A combination of both StyleShoots Horizontal and Vertical machines allows Reischmann's marketing team to create anything from aesthetic flat lay collages for their magazine to stunning quality shots of their garments - giving them the flexibility to produce inspiring content at the touch of a button. As the only machine in the world with an iPad showing the shot in real time, they don't need to spend time they don't have in getting the perfect shot. As soon as new products and collections arrive at Reischmann's HQ, they are sent to their workshop where StyleShoots Vertical and Horizontal machines live. Once the garments have been prepped for shooting, they are styled on invisible ghost mannequins for taking pictures on Vertical. StyleShoots Horizontal is used to shoot flat lay collages. After the images have been shot, they are pushed to Reischmann's system for brief retouching - ensuring the images are the highest quality possible before they hit the web. "Working with StyleShoots is a step forward for us because it's so easy to use and it’s so fast." Because Reischmann pride themselves so heavily on creating a connection with their customers, they regularly produce high-quality fashion editorial content on their website - and in print. This means that finding a way to shoot their clothes in a myriad of ways - creating different looks, styles and inspirations for their shoppers - was a key reason they implemented StyleShoots machines in their cosy German workshop. With StyleShoots drastically cutting the time it takes to produce professional fashion photo content, Reischmann's team have more time to experiment with new looks. They can also react much more quickly to current trends in the fashion world. All it takes is one of their in-house content team to think up a new idea for a flat lay collage on the fly and they can shoot it right away using StyleShoots Horizontal. Now, the shots for their magazines and social media can be created with very little cost - in both time and money. "There are all sorts of different ways we work with StyleShoots. As well as shooting for our website, we immediately publish content to places like Instagram and create images for our magazines"
"StyleShoots makes my eyes light up when I come in in the morning. It’s not just a nice piece of photo equipment - it's an extremely cool machine." Reischmann is a family-owned fashion retailer that specialises in superior service and personal consultations. With stores in Ravensburg, Kempten, Memmingen and Ulm they offer contemporary fashion - from streetwear to high-end designer brands and sports equipment - and shopping that 'stimulates the senses'. 150 years and five generations of family ownership since growing from one single store, Reischmann offers a 'living room experience' - delivering the best possible way to shop for the likes of Burberry, adidas, Michael Kors, G-Star, Diesel and many more.